Flotadas Chimehuin is a family run business that puts the client first with the goal of getting people in touch with nature and providing personalized experiences. We aim to make your trip memorable and achieve a friend out of each client. In Patagonia, Argentina and in Junin de los Andes we have the perfect setting for our guiding operation, places of singular beauty where nature is present in all its splendor. We have majestic rivers, clear lakes, mountains full of vegetation and animals that invite us to fully enjoy all of the activities there are. We feel lucky to enjoy the unspoiled landscape where man has not yet left its mark on the world. 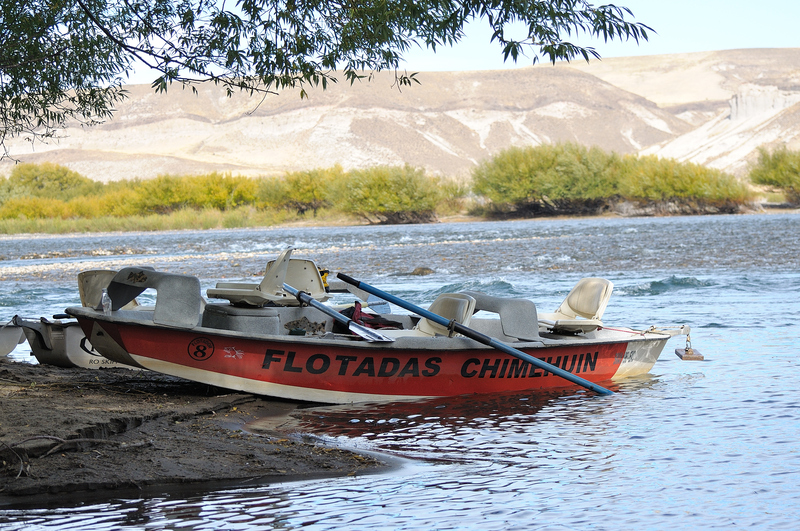 Flotadas Chimehuin offers each person that wants to enjoy this part of the world the chance to wade a classic stream, float and fish a river, enjoy the motorboat on the lake, or stop and camp in remote areas of the river. These are the places where you can stop and relax and take in the beauty that Patagonia has to offer. We invite you to enjoy our gourmet shore side lunches that are prepared by our chef, Yanina. 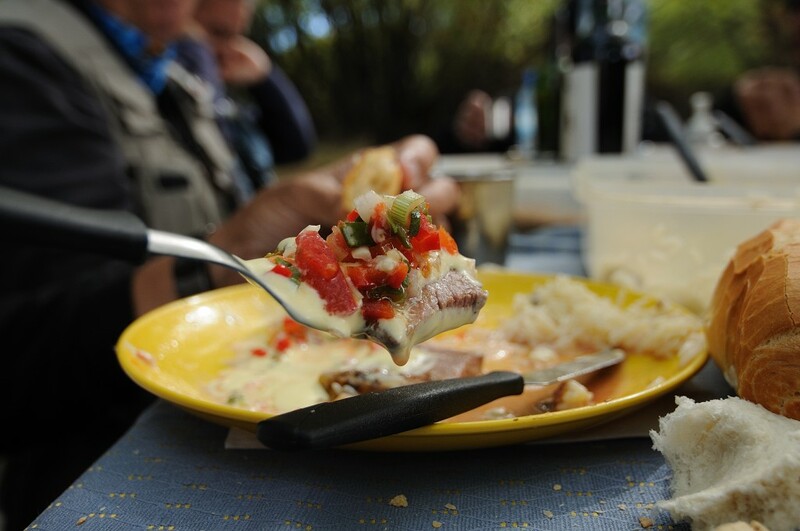 The food we prepare is traditional and gives you a taste of Patagonia. Our foods include smoked red deer, pickled eggplant, beef tenderloin with exquisite toppings, milansesas from chicken and beef, stuffed beef tenderloin, and homemade desserts! 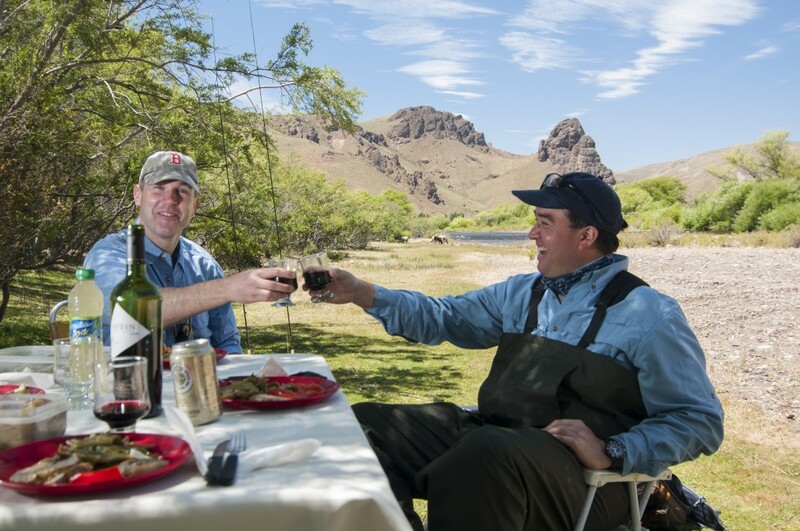 If we stop for an overnight trip we then cook varieties of beef and vegetables, or traditional Argentine barbeques. All meals are accompanied by local Argentine wine and beer as well. Lodging in Junin de los Andes ranges from small hotels, to fancy lodges and chalets. You can either book your own lodging or on our All-Inclusive trips we book it for you. Places we recommend are: Rio Dorado Lodge, Hosteria Chimehuin, Caleufu Travel Lodge, cabañas Lan Park, Loi Suites Chapelco. We also offer cabins and Chalets for our clients and friends that are greatly located close to rivers in peaceful locations. Full camping equipment, tents, sleeping bags, mattresses and cots. For up to 10 people.